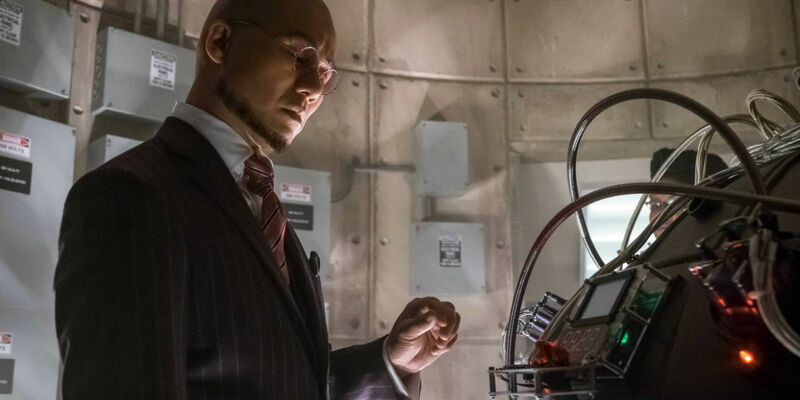 Gotham season 2 has come to a close, as the ongoing saga involving Hugo Strange (BD Wong) and his experiments at Indian Hill reaches a major turning point. Likewise, this episode elaborates on the return of Fish Mooney (Jada Pinkett Smith) last week and aims to tie together the disparate story threads that have extended throughout much of the season. As fans await further news for what to expect in season 3, there's still the matter of wrapping up this year's batch of episodes. So let's get to it with our discussion of this week's season finale, "Transference". Picking up right where the previous episode left off, Bruce (David Mazouz) and Lucius (Chris Chalk) are trapped by Nygma (Cory Michael Smith), and Strange himself interrogates Gordon (Ben McKenzie), having replaced him with the just-introduced Clayface (more on that later). As it turns out, both confrontations hinge on discovering how much our heroes know about the "secret council" that controls everything in Gotham, namely the heretofore unnamed Court of Owls. Although this dual narrative initially indicated that Nygma may have been let in on the secret, it's naturally revealed that Strange was simply using him as a pawn and plans to destroy Indian Hill by the orders of the court. While this part of the storyline was simply a ham-handed way to set up the central mystery of season 3, it did feature a handful of fun moments. Strange's decision to delve deep into Gordon's psyche -- absolving him of all guilt and renewing his resolve to win back Lee -- may not have made sense from a character standpoint (why would Strange bother with all that if he only wanted to know if Gordon knew about the council?). However, it did cut back to the heart of Gordon himself and open up the possibilities for where season 3 may lead him, even if his ill-timed decision to leave means that he won't be around to help catch all the monsters wandering the streets of Gotham. Moreover, Bruce's brief flashback to his parents' death and his jump across rooftops with Selina (Camren Bicondova) was a fairly elegant way in establishing his own motivation and destiny. 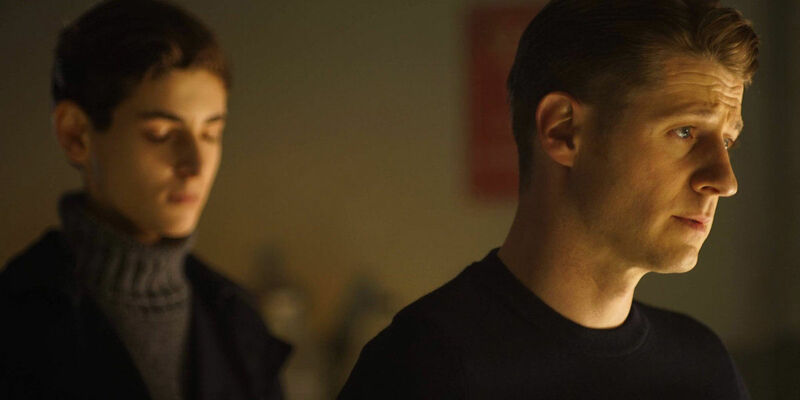 The character's drive thus far on the show has been to solve his parents' murder, and Gotham has neatly transitioned that initial goal into a larger one of unraveling the sinister conspiracy behind the city. If only the show embraced more of this character-driven approach to its story, perhaps viewers would be spared hackneyed plot devices like the ticking time bomb that always stops with one second left on the clock. That being said, Ms. Peabody's (Tonya Pinkins) gag about needing water was worth a chuckle. The final moments of season 2 may have lived up to the "Rise of the Villains/Wrath of the Villains" tagline that has hovered over this year's batch of episodes, but truth be told, the show's central focus ultimately proved to be establishing Hugo Strange and Indian Hill as the blanket origin for some of the most popular Batman villains, including Freeze (Nathan Darrow) and Firefly (Michelle Veintimilla). This decision to homogenize the rogues gallery in this way may anger longtime fans of the Batman mythos, but given the show's determination in introducing a vast array of marquee baddies into the fray, it may prove to be the most efficient way in accomplishing that. Less successful was the show's resurrection of Fish Mooney (Jada Pinkett Smith). The divisive character returned to utter her own name -- followed closely by "b***h" -- once again last week but didn't really contribute much to the episode. This time around, she serves only to inadvertently allow Strange's monsters to escape into the Gotham streets. Her face-to-face moment with Penguin (Robin Lord Taylor) felt too short and anti-climactic, and the emergence of her powers and intact memory still lack anything remotely resembling an explanation. It's this kind of "ends justify the means" thinking that has made the storytelling on Gotham so erratic this season. If nothing else, the show's full commitment to insanity was epitomized with the mass exodus of what will likely constitute a number of popular villains. Fans are no doubt already picking apart the footage for clues (was that Jerome's laugh? Man-Bat? Killer Croc?). However, the most obvious tease for next season was Mazouz as what appears to be some kind of doppelganger to Bruce. Smart money is on that being the comics' Lincoln March (whose story ties into the Court of Owls), but considering Gotham's fast-and-loose approach to the mythology, we'll have to wait until next season for confirmation. If this year was intended to serve as the bridge between season 1's more grounded mob-centric tale and a full-blown monster mash, then all bets are certainly off when the show returns next season. While the Arkham/Indian Hill material shouldered the bulk of the narrative momentum in this episode, the B-story followed Clayface -- disguised as Gordon -- as he attempted to keep the GCPD off of Strange's tail and away from Gotham. The fact that the show would so quickly renege on the promise of the cops raiding Arkham is a bit disappointing, but the chance to see McKenzie play a very different version of his heroic character was a fun change of pace nonetheless. Fake Gordon's wide smile and bizarre facial tics may have made Bullock (Donal Logue) look like a complete idiot this episode (how could he not tell that something was wrong with Gordon, right?). Still, the storyline gave the episode its only real bit of levity and reminded us once again that Barbara (Erin Richards) is perhaps the most all-over-the-place character on the show, to the point that it's hard to tell where she stands in relation to the other characters. At least when someone needs a good punch to the face, Barbara's there to propel the plot forward. Here's hoping that the writers figure out a better use for her next season or just write her off for good. What did you think of "Transference"? Share your thoughts on the episode in the comments section. 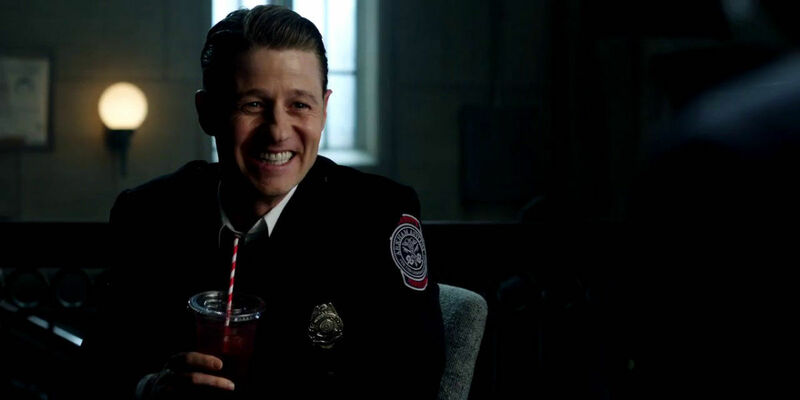 Gotham returns with season 3 this fall on FOX.